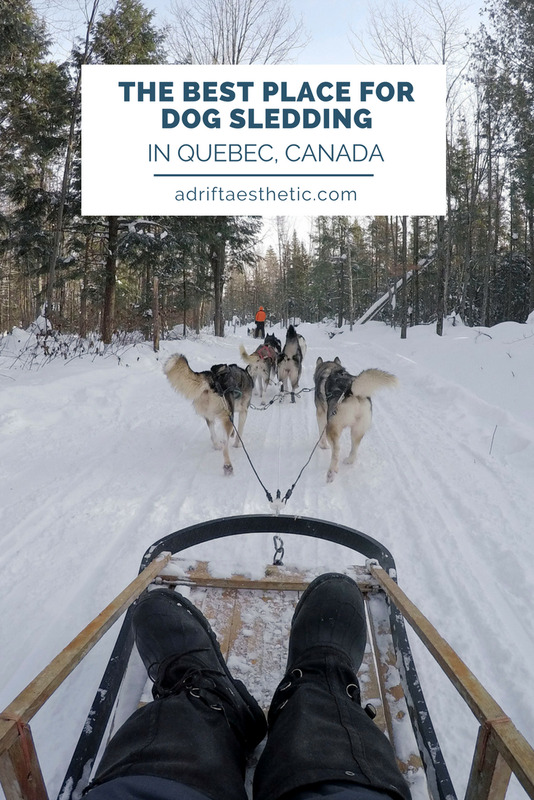 One of the wildest experiences we had on our trip to the Quebec region of Canada was dog sledding through the forests outside of Quebec City. This was something that I've wanted to try since I was a kid and Quebec City turned out to be the perfect place to attempt this winter activity. Just a 20 minute drive outside of Quebec was Chenil la Poursuite, a dogsledding outfitter providing one hour or half day dog sledding tours. Best thing about Chenil la Poursuite? They let you rent snow pants, snow boots, jackets, gloves and other extreme winter gear for free. That meant less bulky clothes and boots that we had to pack ourselves. We arrived early for our half-day tour, ready to take on dog sledding for the first time. After a few minutes of instruction, we were off without a guide on our sled, just following the pair on the next sled in front of us as roughly ten pairs of us headed out. One person drives the sled while the other can sit back and take pictures. Mike and I love trying new adventures but we openly admit we don't always succeed when we do. When we were in California and attempted to tandem kayak in the ocean, I ended up tipping our kayak twice. Dog sledding was a similar struggle because much to our surprise, it's a very intensive activity. I was imaging just relaxing in a sled and letting the dogs do all the work, maybe steering them a bit or giving them a "Mush!" every once in a while...kind of like horseback riding. We weren't prepared to actually run (in our snowboots) to push the sled up hills or kick consistently with our left foot while our right foot balanced on the sled to help the dogs along when the snow got too deep. We burned A LOT of calories over the 4 hours of sledding and were exhausted by the end. At one point we went down a steep hill then a sharp turn that threw Mike off the sled while he was driving. I ended up on a runaway dog sled with no one steering or controlling the brakes! Those dogs are fast when they want to be and having just me on the sled, they were probably able to run even faster. I threw my leg over the side into a snow drift and finally got the dogs to slow down and stop as Mike came running through the snow to catch up. Despite our struggles, we did finally get the hang of dog sledding and when our extremities weren't going numb from the -30 degree F temperature, it really was a gorgeous ride. We covered roughly 6 miles of backcountry trails going from dense forests to open valleys. Except for the path, the snow was virtually untouched and provided a pristine white blanket on the ground and hung to pine trees like a Christmas card. The dogs themselves were impressively strong. The fact that six of them could pull us on a sled through thick snow for that long shows how useful these pups are to the people of Canada. Plus they loved pulling the sleds; whenever we had to break they would start barking and jumping, ready to continue running. Halfway through the trip we stopped at a yurt in the forest to warm up. Inside was a wood stove with a roaring fire, hot chocolate and cookies for a sugar rush. I used the time to dry out my socks and boot liners that had been soaked from from earlier trying to stop my rogue sled. After about half an hour we were on our way again. Now feeling like seasoned veterans of dog sledding, we made our way back to the visitor's center without a problem. Dog sledding turned out to be a much crazier adventure than I expected. Even though we had some issues over the four hours, I'm happy we gave it a try. The icing on the cake was being able to spend time with the dogs and puppies on site afterwards. 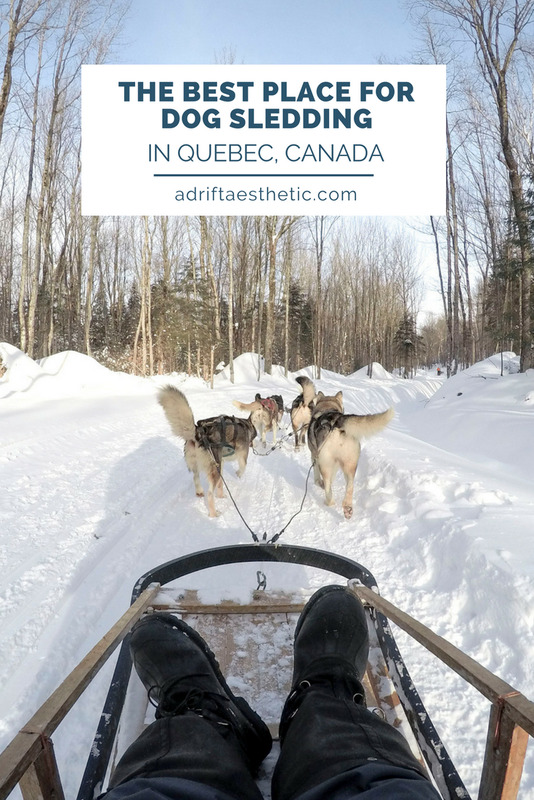 Dog sledding is such a unique winter activity and the fact that it's so close to downtown Quebec City makes it a perfect day trip on your next vacation.